How I got the idea– I bought a new, quite expensive golf bag and as with many bags, the accessory hanger just was not convenient for me. I put the 1st product together at my kitchen table and had it sewn at a local dry-cleaner. Golfers saw it and liked it and here we are. What people like about it- People like the fact that it is a simple solution to reoccurring problem, it gives them accessory placement options and, that it improves their golf bag without much effort and does not take away the ability to use the rain hood. They like that it does what it says it will do and makes golf accessory placement location their choice. Our accessory hanger began with one person and one idea in mind; the individual golfer and giving that golfer accessory placement options. Golf bag manufacturers do a great job in giving golfers numerous places to put all of our golf gear, but they can’t personalize it to the point that it fit every golfer’s accessory needs or preferences. 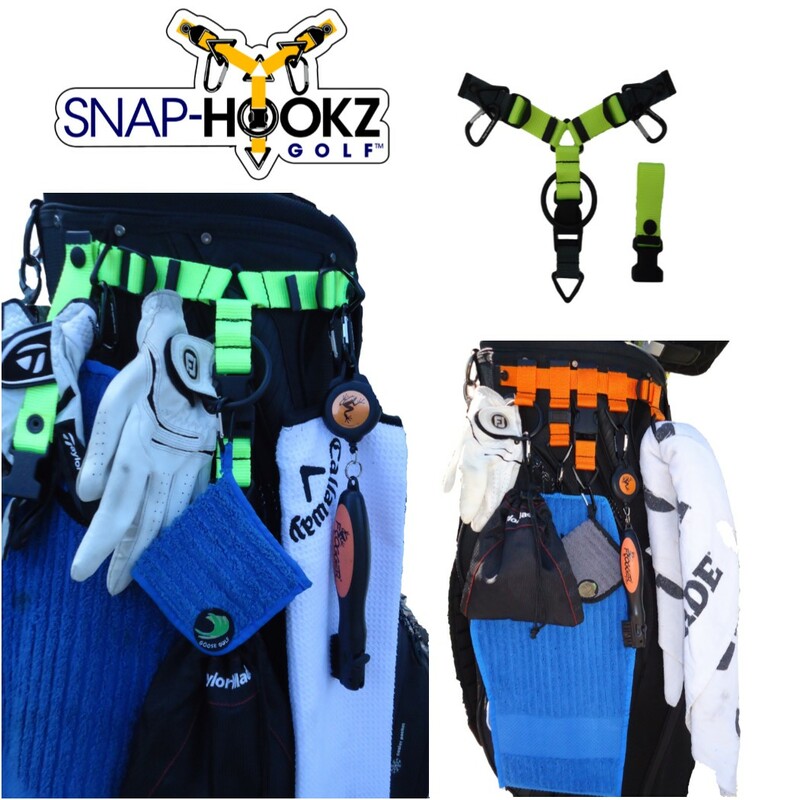 This product gives you the option to attach your golf towel, club brush, gloves, range finder, water bottle, etc.., on any part of the bag you choose. This is possible by a simple strap adjustment, followed by snapping the device on any two existing rain hood buttons and adding your preferred accessories. All bags have a hanger built in, but as you know, it is not always positioned where we would like it to be and now, this inconvenience is no longer an issue. Our accessory hanger simply gives golfers the option to have their accessories in an area on the bag that makes access easier, as well as being able to separate accessories for a more organized golf bag. Standard belt attachment and detachable lower hanger section ensures accessories taken with the golfer, stay with the golfer. Belt attachment can also be used as an additional glove holder by snapping it onto the main hanger and velcroing gloves onto the strap.